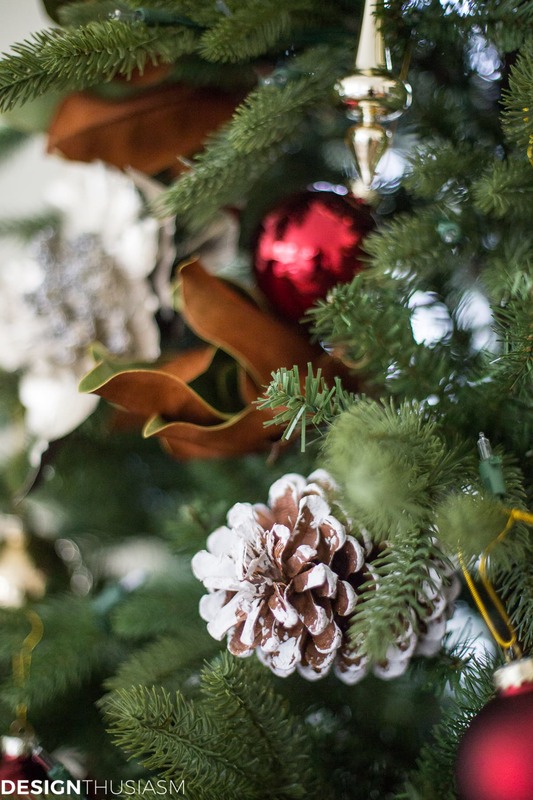 Do you have a spot in your house that’s just calling out for a Christmas tree? We’ve all seen those perfect spaces. That gorgeous bay window the looks out on the street. A huge circular foyer with super high ceilings. A landing upstairs that can be seen from multiple angles. Maybe you have one of these ideal spots. But is it necessarily in a part of the house that you actually use? We have exactly one such spot. A pretty bay window at the front of the house. However, it’s in our living room, a room we rarely use. Instead, our family room is the place we spend most of out time. I’ve looked at the space many times to try to figure out where a tree would go. Who knew all it needed was a slim Christmas tree? Suddenly a small corner was just enough space! 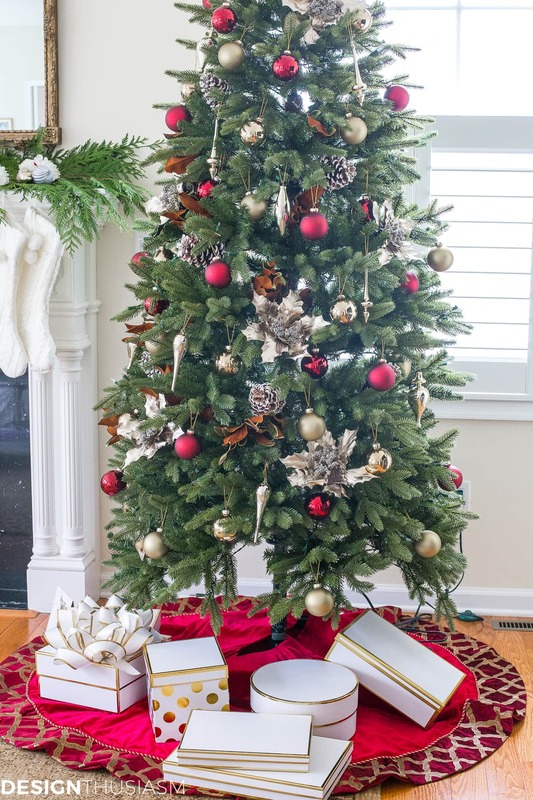 I’m delighted to be a part of the 12 Days of Christmas event, brought to you by my sponsor, Tree Classics, who provided this lovely tree and accessories, bringing cheer to my most often used space. Be sure to visit the other bloggers’ posts, as well, so you can enjoy all 12 Days in our countdown. 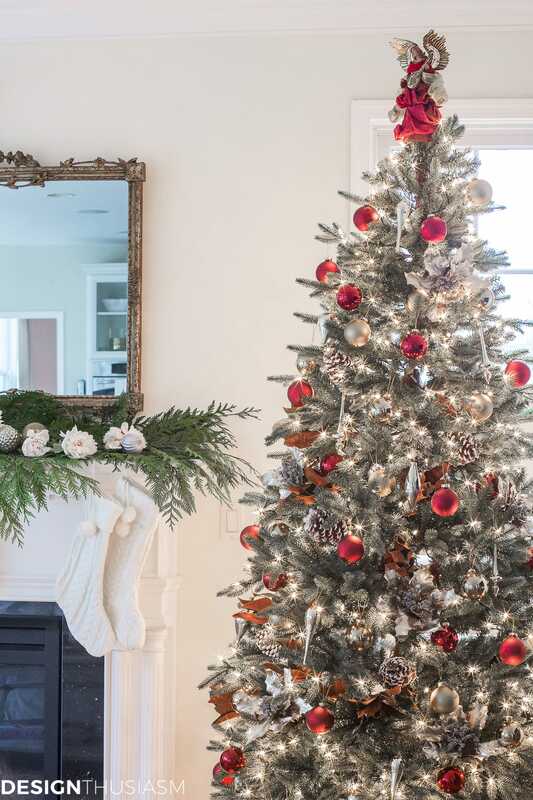 For my family room corner I selected the Kennedy Fir Snap Tree for its narrow shape, as well as its easy set up. Coming in just 2 pieces that snap together simply, there’s no searching for plugs or various pieces nor complicated instructions. Despite its slim shape it’s lush and majestic, with life-like branches that fluff nicely into shape. The location in the family room made it possible to place the tree next to our fireplace. 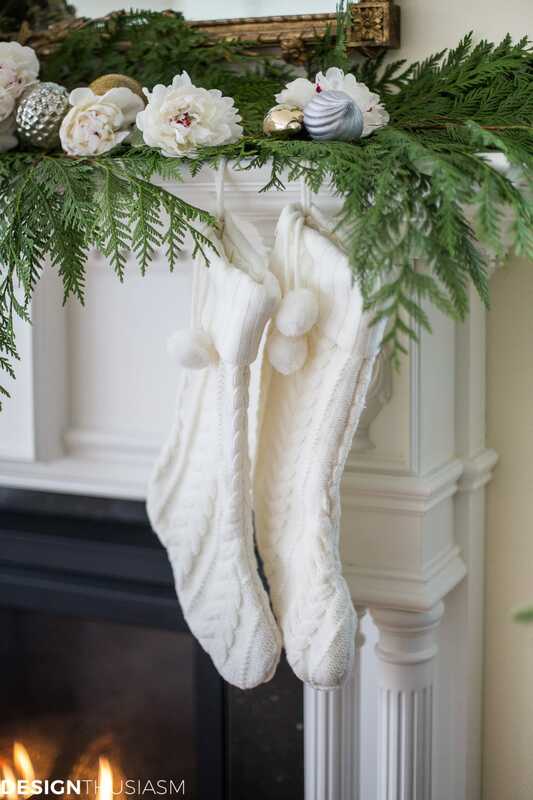 The charming faux limbs look perfectly comfortable sitting right next to fresh cedar branches. 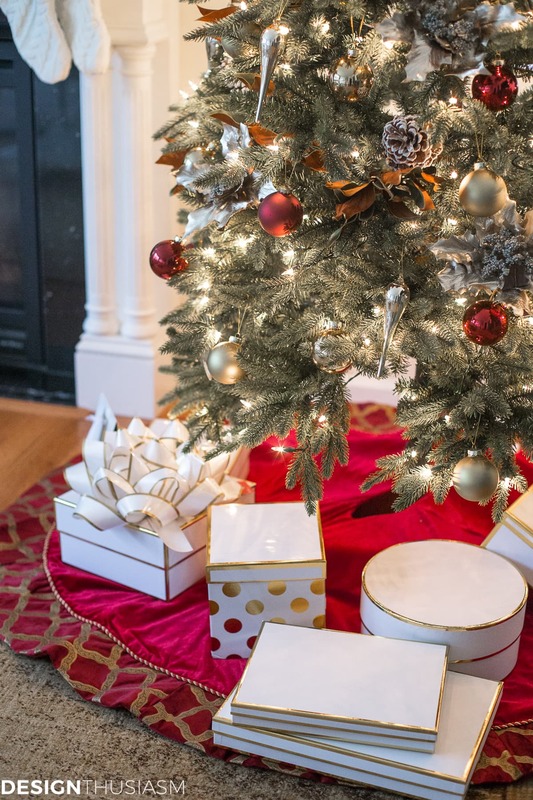 For embellishing the tree, I started with the Burgundy & Gold Assorted Glass Balls, a nice full box of fifty pieces that sets the tone of my color palette and goes a long way to dressing up the tree. I also added champagne gold finials to vary the shapes by adding longer pieces. 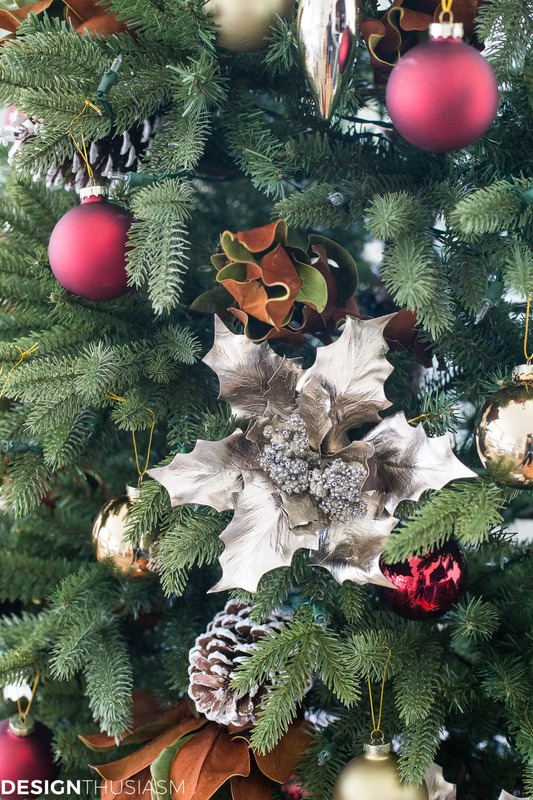 From there I added poinsettia tree picks in a pewter color that really make a grand statement. A little goes a long way and I only used about a half dozen. At the base of the tree I used the Burgundy & Gold Tree Skirt for a rich foundation that offers striking contrast from the gold trimmed gift boxes. 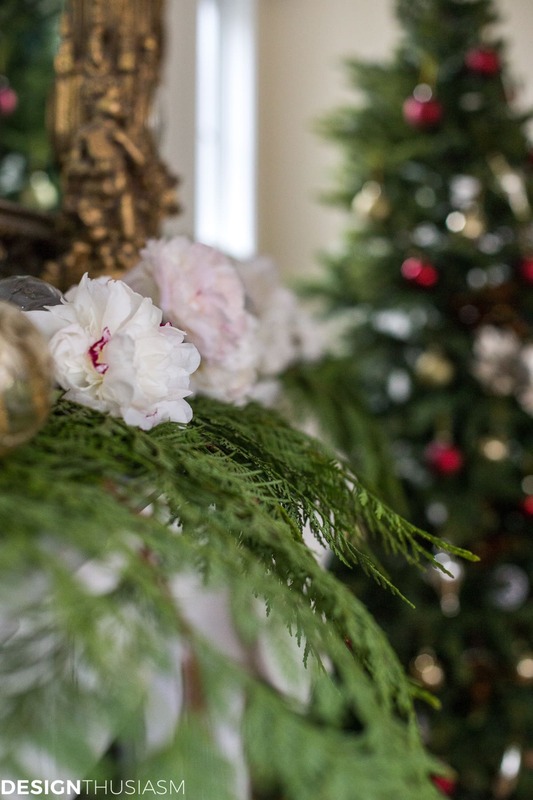 A peek at the mantel shows a little hint at the full presentation that I’ll be revealing next week. The slender tree gives a tall appearance and topping it all off is the Amazing Grace Angel Tree Topper in burgundy velvet robe with gilded wings. I opted for the clear tree lights but you can also get the LED color changing ones. 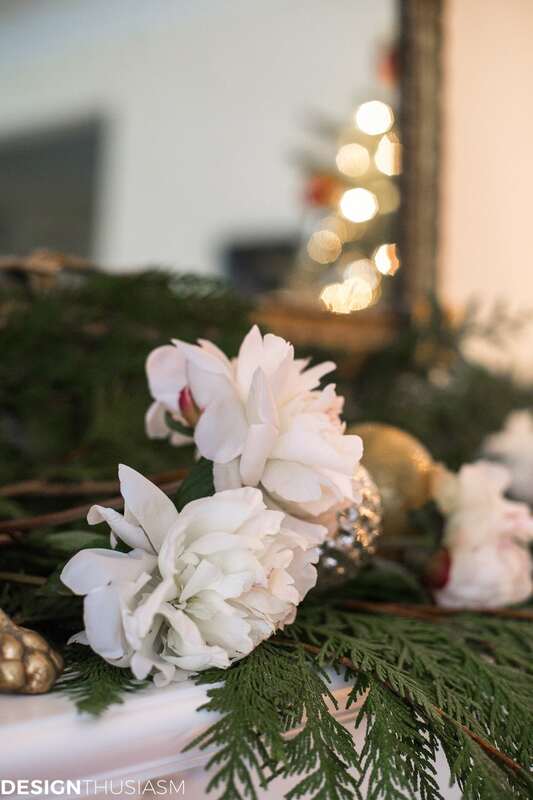 It’s fun to add in natural elements too, so I tucked in fresh magnolia leaves and white tipped pine cones. 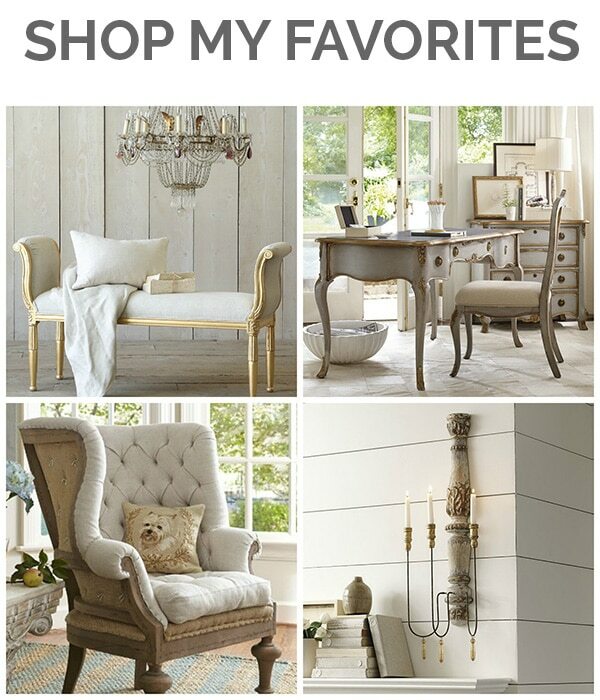 I love to nestle into the couch with the fireplace going and enjoy this cheerful corner in my most used room! 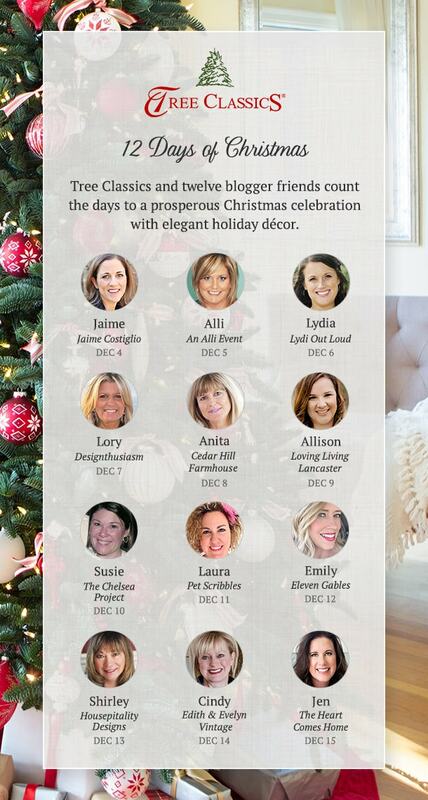 also from my friends at Tree Classics! Absolutely beautiful as always Lory. 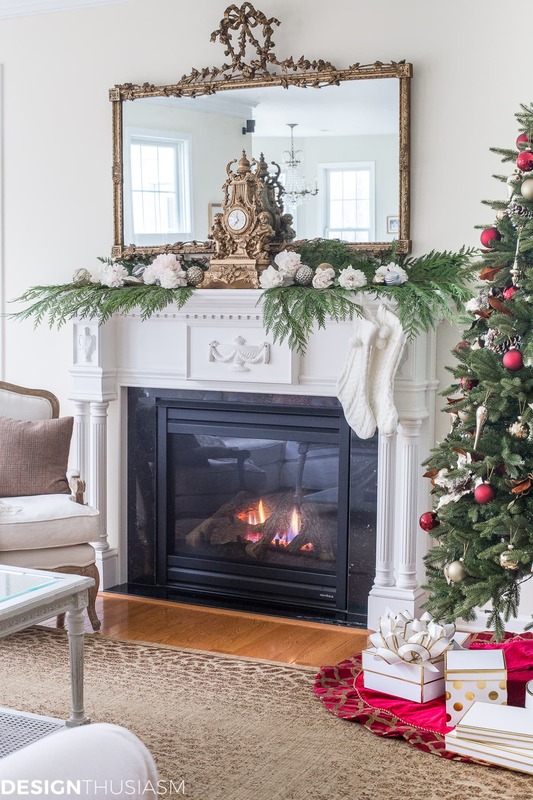 I love the slim tree, and how you added the greens on each side of the clock on the mantel. I’m in love with your rug too–a pattern I’ve always liked in home décor. It’s just absolutely beautiful! Perfect spot for it too! I love how you’ve tucked in magnolia among the branches. It’s perfect! Thanks so much, Emily! I had a lot of fun with this one… 🙂 Those magnolia leaves were on the mantel for a while and they were ready for a new spot… lol. Your tree and room are gorgeous, Lory! I have a spot that would be perfect for this tree size. Gotta love the Snap Tree too! 🙂 Happy holidays! Thank you, as always, Norma!! So very beautiful Lory and it is perfect in that spot!!! 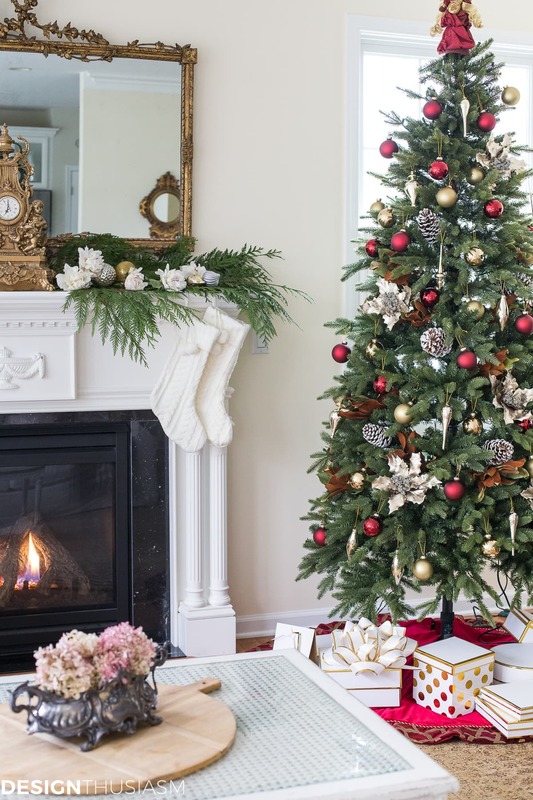 I have that same tree and it is fabulous…I prefer slim trees for the space saving value of it….you have truly decorated this wonderful tree so beautifully for your family and friends to enjoy for the Holidays..love the mantel too! Always swoon over that clock too!!! Happy Holidays Lory…will look forward to your Snowy Sunday feature!! Oh Lory….you have outdone yourself with all of your holiday decor this year!! Gorgeous, and I adore the white tree too. 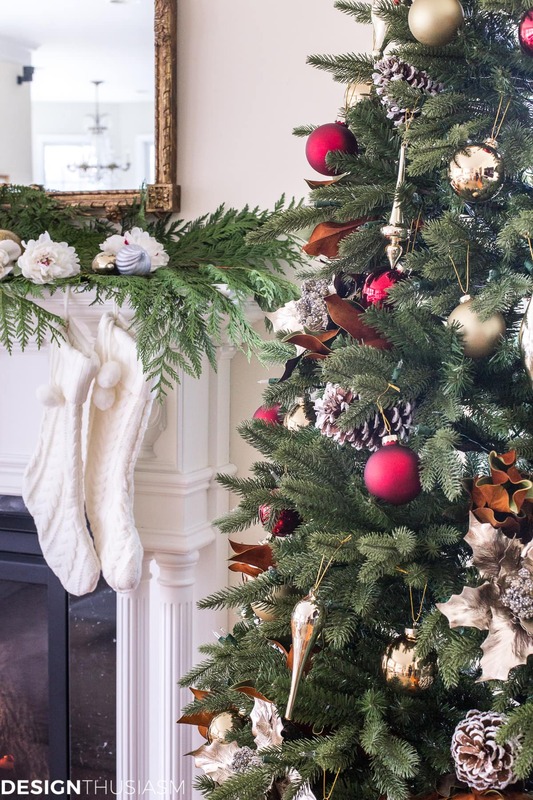 Lovely tree and your mantel is stunning! 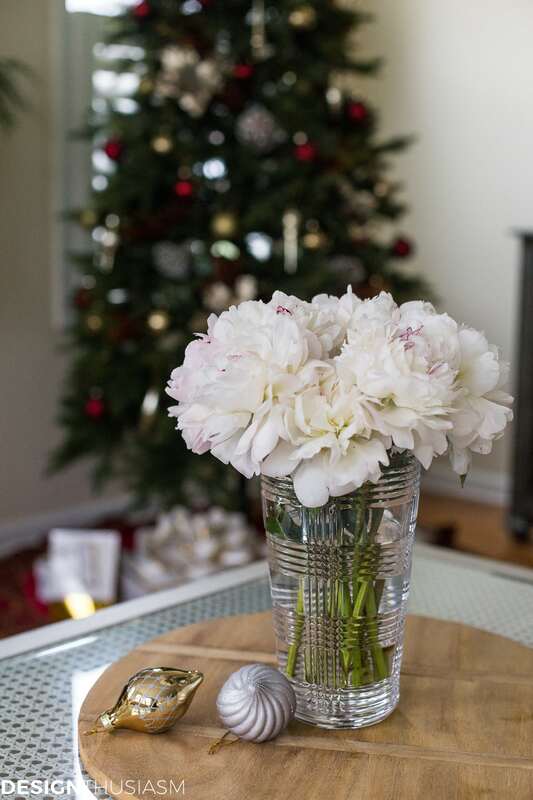 Thank you for sharing your beautiful Christmas decor on Share Your Style. Thank you so much!! And welcome!